In the last week, an idea was floated and supported by members of the Kikuyus for Change to take a step in addressing the victims of the Post Elections Violence. The case that was chosen was of a couple that was affected by the Kiambaa fire tragedy and 4 other families. For any Kenyan, the name ‘Kiambaa’ means something different since the Post Elections Violence (PEV) in Kenya. It no longer means just an area in Kiambu county but a Church in Eldoret where lives were lost in a gruesome way. The PEV was the most horrific violence that Kenya has experienced post independence. Arguably severe PEV has been happening around every General election in Kenya for a long time but the development in ICT may have hindered the reporting and hence realizing of the full extent of the violence. However, the violence has been in most cases in one or two regions but in 200/2008 the violence rocked the whole almost country brining life to a standstill. One of the most shocking occurrences of that violence is an image of a Church burning – The Kiambaa Assemblies of God Church. Churches have represented a safe, sacred place that anyone in trouble can seek help. When women and children were caught in arson in a Church it was very disturbing. One of the pictures that Kenyans and other people worldwide have etched in our memories is the picture of a child being thrown back into the fire. It is with this background that the five of us members of Kikuyus for Change set out to visit some of the survivors who currently resides in Naivasha. We left Nairobi around 3.00PM on Saturday 25, June 2011. We arrived and were received by the family of Harun. 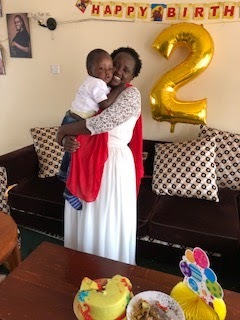 Having got the brief via email on this family, it was not easy to imagine there will be much ‘news’ but it turned out that right from the time we stepped into the house, it was aha! Listening to Harun narrate their experiences as the wife (Mary) listened for most times it was not easy not to wonder how they have lived to tell the story with much energy that makes one forget the context of the information. I wish to share a few issues that stood out. While we have heard/ watched the experience of the Kiambaa fire hearing it from first-hand experience is quite different. Mary, the wife of Harun was in the Church when the fire was set. It was actually shocking to know that the fire was set at 11.00am (muthenya!!). For some reasons many of us have assumed it was at night. The group of men and boys who had gone out to ‘protect’ were overpowered by the gang that came hence had to run for dear lives. The women and children were in the Church and for Harun’s family, Mary was in the Church with three children. One of them (Joyce) 3 years was tied on her back. They managed to break windows and doors so she pushed her older kids to run for their lives as she also struggled to save her life and that of the baby on her back. The fire engulfed burning the lesso she had tied her child with hence the child fell into the fire. She turned to try save her child who had fallen into the centre of the fire, crying ‘Mama niokoe’ and that’s how Mary got more burns on her arm and her child burnt to ashes as she fell into the fire and more people trampled on each other. I am sure I can’t ably present that experience. The son who was about 12 years was traumatized to the extent that he would often be seen making ‘guns’ using wood, and constructing some ‘bombs’ as he said he would go back and bomb those people. With time he got counseling and a good Samaritan has taken him to boarding school. The other son scored a B (-?) despite the circumstances he studied under. He hopes to join university; he didn’t attain the marks to get to the course of his dreams – medicine. The experience has a silver lining in the little daughter (7 months Mercy). The jolly girl seems to represent the hope in that family. She has no idea what happened, never experienced it, and seems to be a copyright of the late daughter. Severally Harun would confuse and call the girl by the late daughter’s name. Listening to them share the experience and declare their forgiveness for the perpetrators was a picture of hope. They can’t consider going back due to the trauma of the experience but they have appreciated the good Samaritans including those from the same community that burnt them and turned their lives upside down. They cannot sit back and condemn a whole community. In fact the person who gave them the first very life saving help of blood donation was a Kalenjin, the persons who have sponsored two of their children were Kalenjins. That for me is a picture of hope in this murky situation. Harun shared the experience of his housing woes that left our mouths wide open. Harun’s family was among the five families that had survivors who had suffered grievously hence needed to go for regular clinics. A certain ‘good Samaritan’ welcomed them into his rental houses through arrangements with the Provincial Administration and the government promise of resettlement. The brief of the story is that the housing was costing Kes 750 and later Kes 800 due to increase in electricity. (the electricity would be put on between 6.00pm and 6.00 am by landlord. The donkeys could not come into the compound to bring water for them hence they needed to fetch water from a distance while several of them had been impaired). The ‘good samaritan’ also gave them Kes 6,000 each (total 30,000) as a good will to help them as they tried to settle. There was a memo signed by this man to that effect and another for the rent fee (Kes 800). First forward a few months later when the government actualized, the IDPs cash award, this landlord was handed Kes 240,000 for these 5 families’ rent. This is where the drama starts! He deducted ‘his money’ and sent them the information. This was computed as @Kes 2,000 rent per month (yes, 2k not 800) for 17months. He then deducted VAT 16%! He then deducted the Kes 30,000 that he had previously charitably given them. This rent then expired in April (I think) hence in May they were sent a notice to vacate (through a lawyer). The letter is demanding the overdue rent for May (Kes 2,000) plus Kes 2,000 fine and Kes 1,000 legal charges! (A total of Kes 5,000). This seemed like an imaginary drama but with documents to support this which we got copy. We were made to understand that other tenants have been paying rent of 800 to date! Picking the pieces and moving on. A certain family offered Harun’s family a place to stay for this month (June) and July for free. It a small house, their son’s ‘maskan’ hence the son moved back to the parents main house. Harun and his family reside in this small house, not sure where to go after next month. It is encouraging to see the determination that this family has for moving on and picking pieces of their lives even when they can’t locate the broken pieces themselves. Several issues come to mind that really struck me. Harun has had to change from being the bread winner to the person taking care of the nurturing and caring roles in the family. The wife cannot get near a fire and sometimes her injuries are painful that she can’t even tend to the baby. He has embraced the otherwise feminine gender roles in his household. He can’t manage to get out for long to seek for daily bread as he does the housework. He expressed that he is determined to continue sustaining his family in whatever ways he can and love his wife as he did before she got injured and disfigured. He has chosen to look for ways of empowering his children realizing there is hope for a future. I was struck by an instance where someone gave him Kes 10,000 and he asked the person to instead pay the money to a college so that his son can do computer courses after form 4 exams! Treating education as a basic need even as he struggles for food. He expressed that the faith in God has sustained the family. ( actually the first thing I noticed as we entered the house was the Bible on the stool plus other Christian book). He has made a conscious effort not to let faith and God die and brought up his children to be God-fearing. I was so impressed by how organized this man is. He has kept records and copies of many things that one can easily discard. He has hope that one day he and his family will have a normal life. We were happy that by the end of our visit and a lot of talking the wife Mary laughed! Sometimes it’s hard to find hope in such a situation. Unfortunately we were so caught in this family’s story that we didn’t get time to visit the other families. I hope that we will a step at a time make a difference to these 5 families for a start. The families were given some piece of land to build, but they don’t have a single cent in their name.